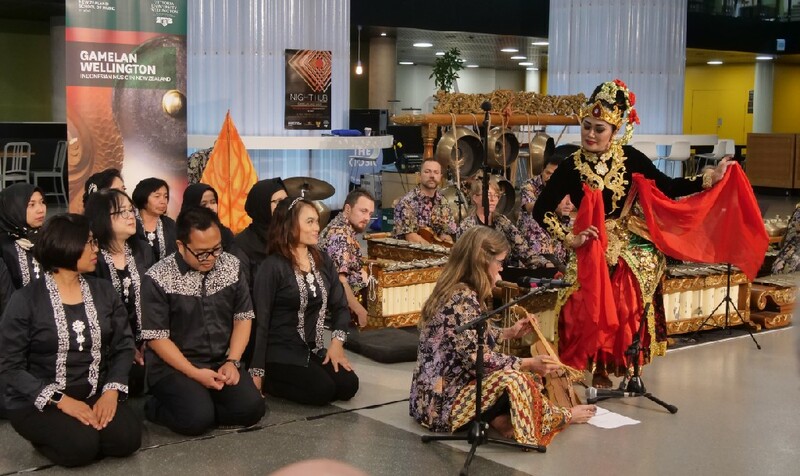 A gamelan concert at The Hub, the central arena of Victoria University campus, had long been planned for the evening of Friday 22 March. A combination of two gamelan—Javanese, Gamelan Padhang Moncar, and the Balinese, Gamelan Taniwha Jaya, would play. 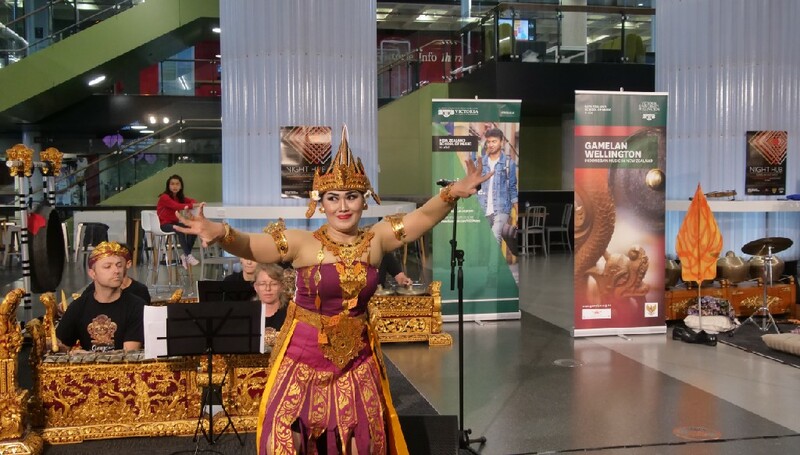 A dance troupe from Surabaya in Java would join as special guests to the program, and the local Indonesian community choir would also participate. Late in the planning, funding to bring the full dance troupe from Indonesia was not forthcoming so the leader, Sri Mulyani, director of Mulyo Joyo group, travelled to perform as a solo dancer. One week to the day before the concert, all hell broke loose in New Zealand. Fifty Muslims attending Friday prayers at two mosques in Christchurch were killed by a rabid white supremacist, 50 more were injured. The country came to its knees and the world looked on in disbelief. Jacinda Ardern has been widely praised and thanked for her instinctive and tireless leadership in stepping up to lift the nation out of the mire. Sadly that’s going to be a slow process as we are still stunned by the surreality of it all. Tens of thousands of New Zealanders have been searching for ways to say how saddened we are. Many speeches have been delivered, opinion pieces written, uncountable numbers of flowers and messages placed in tribute, human chains formed around mosques, beacons lit and songs sung, haka performed, messages chalked onto footpaths and walls and windows the length and breadth of the country. Black Power and Mongrel Mob gang members have stepped forward and spoken their thoughts to unify the thinking of hitherto disparate groups. Their public and spontaneous haka, and their offers to stand guard outside a mosque while Muslims pray inside, are not expressions I had expected to see or hear. I feel changed by them. Should Friday’s concert proceed? Yes it should. Gamelan has a 45 year presence at VUW and will not be easily silenced. More than ever before it seems that listening to and looking at and learning about ‘other’ music and dance is one pathway to understand and appreciate ‘other’ cultures. But what is this ‘other’? The gamelan over these decades is self-evidently a mix of Indonesian, other Asian, Pakeha, Maori and Pasifika players. New Zealand does not, as many countries do, require proof of percentages and proportions in its official count of ethnicities, but instead invites citizens to register their ethnicity of choice, and apparently we have 200 of those. Intermarriage doesn’t weaken anybody, it strengthens bodies. We are different, we are the same, we are many, we are one might sound like a mantra but it does cover the realities, or at least the possibilities, or it should. (mantra: originally in Hinduism and Buddhism—a word or sound repeated to aid concentration in meditation). It’s the balance, the mix, the layering of what is distinctive about us and what is the same, what can be shared and what can be exchanged, that we could source. We might start with the facts: gravity exists and, mostly speaking, the human body locomotes on two legs, in the vertical. That much is universal. How we dance, and how we appreciate a dance, is part of who we are. There is work to be done. Dedication to high and lively standards in music and dance is one path to walk. Interpretation and commentary in program notes from performer to audience are welcome challenges, and these were well met on Friday. (No one questions a Chinese professor playing a fabulously furious piano concerto by English composer Benjamin Britten, or the tender breathing of German composer Robert Schumann’s Kinderscenen. OK those composers are European, but the pianist is Chinese, remember. Just let it be good). No one questions who should play gamelan. How it’s played is the measure, just let it be good. Sharp and on the beat, or upbeat or offbeat, quiet or strident, let the cues be clean, the timing tight and the rhythms secure. Let its ornaments escape and float above the keys of a gatra. To an audience possibly double the size that might have been originally expected, the program opened with a Muslim greeting followed by a minute’s silence in memoriam. Introductions by Dr Megan Collins, manager of the gamelan, and Professor Sally Jane Norman, Director of NZ School Music, Te Koki, set a dignified yet welcoming tone. The Indonesian Ambassador was absent, attending the 7th day memorial gathering in Christchurch (one of those killed and several of those injured were Indonesians) so the Embassy’s cultural attaché spoke in his place. The Javanese gamelan’s name, Padhang Moncar, can be interpreted in several ways. Padhang is brightness or daylight. Moncar means growing or developing vigorously. Padhang Moncar can refer to the sunrise (the growing light), and the fact that in Aotearoa we are the first gamelan in the world to see the new day. The Balinese gamelan’s name combines the Maori word Taniwha, a mythical water monster, with the Balinese word Jaya, meaning glorious or victorious, to symbolise the mix of New Zealand and Balinese cultures. Both names seemed freshly relevant on Friday evening. The opening item was a ritual-like dance in which Sri Mulyani carried a large flickering lamp on her head and danced it onto the floor—’to rid the performance space of evil’. Budi Putra, director of Padhang Moncar, who had lost a close friend in the Christchurch attack, had arranged the item to the poem Tembang Macapat Sinom Gedong Kuning, in the particularly striking poetic form of macapat. 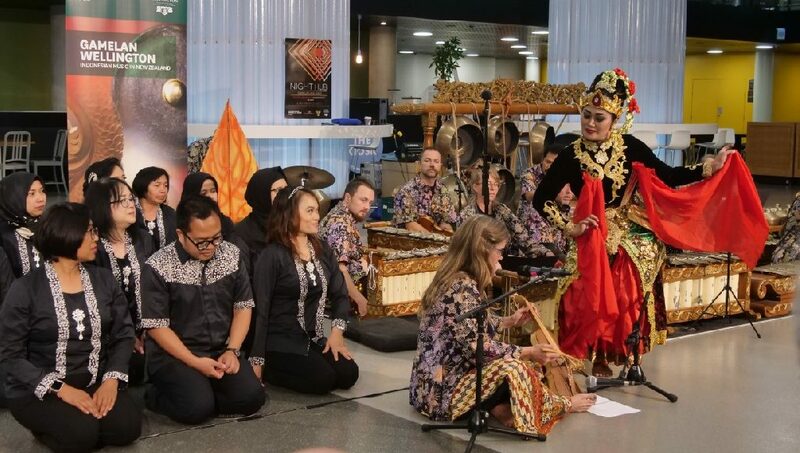 A gamelan colleague in Dunedin, Dr Joko Susilo, a 7th generation traditional dhalang/puppeteer from Java, has made a doctoral study of the song poetry macapat, used as a form of exorcism. ‘Martial art’ is too amorphous a term to catch the qualities of strength, clarity and authority in the dancer’s arm gestures and facial expressions that are employed to command and cleanse a space of illness, evil and wrong. A Balinese gamelan item followed, with the theme referencing the handsome King Arsa Wijaya. It was masterfully led by Rupert Snook as the distinctive sounds of this glistening ensemble were released to fly around in the open acoustic. The intricate rhythmic patterns and connections seemed galvanising. Items from the Indonesian Chorus included themes of the sound of the flute, and other relaxation pleasures, in several songs and dances. Mulyani’s dance is a Surabaya style fused with the hallmark angularities of Balinese—and elbow, knee and ankle alignments, and mercurial movements of head and neck, hands and fingers, darting eye glances and spontaneous changes of direction—measures to ward off the evil spirits that travel in straight lines. A further item was in striking contrast to her opening macapat, a shimmering affair this, with the solo dancer simultaneously depicting a pair of courting Birds of Paradise. Now that takes skill and we should pay attention to how a dancer can depict two creatures at once, and birds at that. [Many forms of indigenous dance traditions absorb a people’s long-standing observation of native birds and the detail of their appearance, their nesting and courting behaviour into stylised choreography. Mythological reference to birds, their song-making and ability to fly to distant realms are found in many performance contexts. Most notably in Melanesia the fabled Birds of Paradise are absorbed into ritual and choreographed display as a people locate themselves within the flora and fauna of their surroundings. Birds of Paradise, after their deaths, had their legs and sometimes wings removed, in mythological re-definition of them as birds that had not needed to land on Earth, nor needed flapping wings to fly, but were simply able to glide and swoop on draughts of air, while visiting their homes in Paradise then returning to the skies above Earth. Their feathers worn in dancers’ body decoration connected humans with the avian and celestial realms. Banabans dance as the frigate bird flies. Their connection to their former Central Pacific homeland, long destroyed by mining for phosphate, is evoked through talisman dance forms that incorporate frigate feathers into their costume and ornaments. That’s about as close to home as Banabans are able to reach. Margaret Orbell in her beautiful book, Birds of Aotearoa, documents how Maori incorporated birds into their lives and lore. It’s a book for every library in the country. Her evocations of the ancient Dawn Chorus include description of the little piopio, now extinct, that used to continue singing solo for one hour after all the other birds had ceased. We might have a birdsong broadcast each morning on Radio New Zealand but for a minute not an hour, and never the piopio]. Swathes of silk attached to the dancer’s fans are thrust and tossed, reminders of other incorporation of textiles into Asian— Chinese silk sleeves, ribbons and banners, of Indian and Japanese elaborate costumes. These are not just arbitrary dress-ups, but are images and characters from stories, and we will always need stories if we are to make sense of our lives and ourselves. A Javanese gamelan item then referenced a character from the Mahabharata, the evil King Rahwana a multi-headed demon-king who wrought wholesale carnage. A resonant theme indeed this evening, but it also evoked for me the monstrous Puputan events in Bali, 1906 and 1908, when armed Dutch invaders headed into the crowds of Balinese priests and performers who had donned ceremonial garb and processed their way into mass suicide, over 1000 of them it is said, since they had no other weapons to use. It’s not a good story but it’s not an ancient one, dramatised into epic literature either. It’s only just over a century old. The themes of The Mahabharata involving huge and violent clashes and ongoing battles between forces of Good and of Evil, were never more apparent than at this concert. A few days ago we were hearing, amid anguished tears from those who were there, reports of the river of blood that flowed out the doors and down the steps in front of the Christchurch mosques. Police, ambulance staff and medical colleagues had to work to identify 50 bodies within that scene of carnage, a challenge that required five days and nights of dedication to unimaginable tasks. After that the mosques had to be cleaned in readiness for the return to prayer. Themacapat in Wellington will have helped spiritually albeit from a distance. King Rawhana stepped from the pages of The Mahabharata, came to Christchurch uninvited and wrought unspeakable carnage. He has since been banished by the stronger forces of courage, compassion and care, by police, emergency staff, medical personnel, leaders and citizens, media, and by musicians and dancers. If this review reads as ‘over the top’, that is precisely as intended.